A 10X10 Players have a ball each having as many touchs as possible using different parts of both feet, also trying any tricks they have, only rule is the ball does not leave the floor. B 10X10 Players have a ball each, and the aim is to see how long they can keep the ball of the floor via keep ups, using anythink but thier hands. · Warming up raises your body temperature slowly, helping to warm up your muscles. · As you warm up, you will be able to get yourself mentally ready for the training or game to follow. 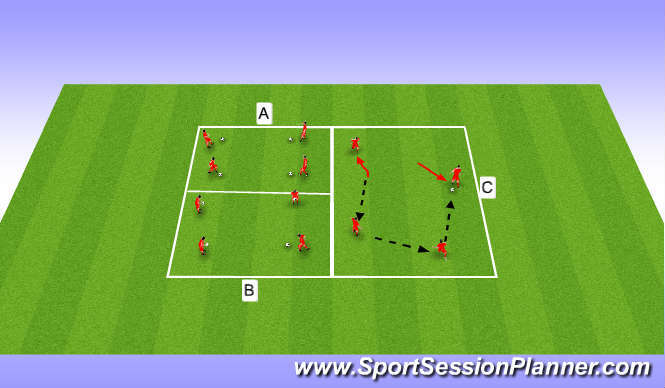 Organisation: Area 25x25 Devide players into 4 different teams, giving them a ball per team, letting them pass their ball around the pitch without hitting each others ball or bumping into each other. Progress this game by giving players a number and to pass in order, also limit amount of touchs. Organisation: 3 Grids two the same size at 10x10 and one at 15x20. 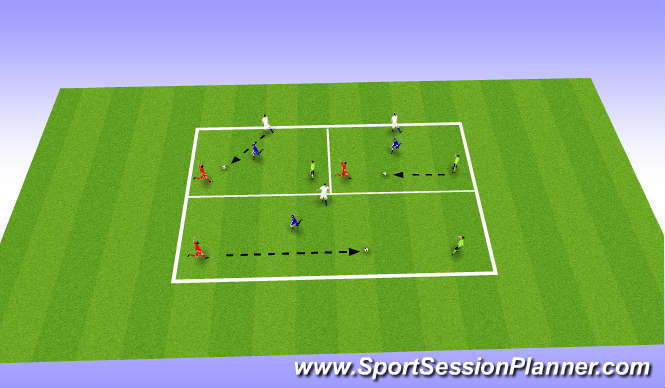 One player from each of the four colours in the middle has to win the ball, if he wins the ball, the player who loses goes into the middle, if the other 3 players can make 5 passes without losing ball, they all shout rotate, Then every player moves around to the next box clockwise. 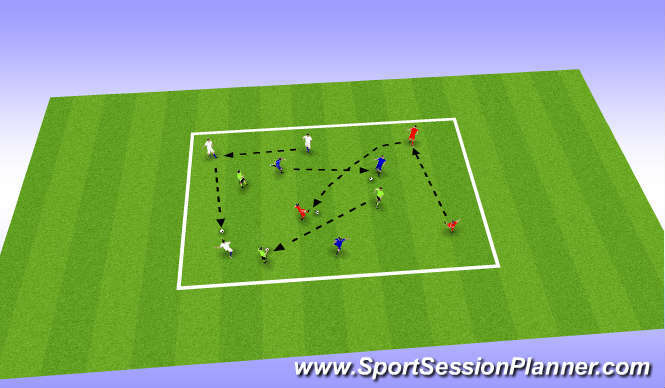 Can progress this session by making 2 squares and 3 teams, creating a 4v2 game in each area, same senario, when a team lose ball, they become the defenders. Key Factors: Passing, Control, Awareness, Body adjustment, communication, movment, closing down. 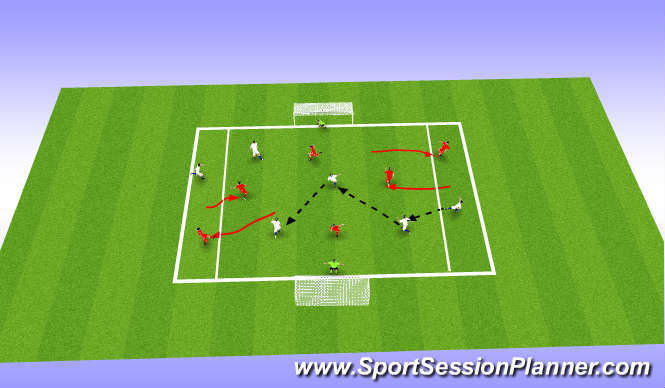 Organisation: 4v4 Game, with a server on either side, team can only shoot after making 5 passes, they can include server in these passes, 2 players to rotate with servers every time a shot is made, giving a quick chance to create a 4v2 in the middle. Progress by limiting touches for each team.